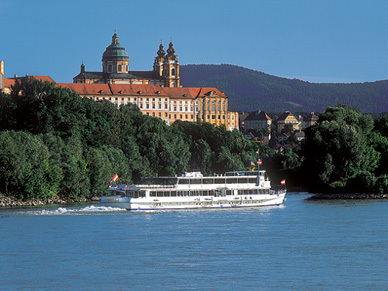 A full-day excursion which gives you a taste of the charm and beauty of the Wachau Valley. Through romantic scenery full of history and legends the Danube winds its way past picturesque villages and steep vineyards. The many ancient castles testify to the former importance of the river as a trade and traffic route. Perhaps the most famous castle is Dürnstein - now a ruin - where legend has it that Richard the Lion Heart was imprisoned before being found by his faithful minstrel Blondel. A romantic boat trip will bring history to life for you. The heart of the Wachau wine-growing region is the old city of Krems. The highlight of this excursion is a tour of the Benedictine Abbey of Melk, a pearl of the Austrian Baroque. There will be time for lunch at the restaurant at Melk Abbey!